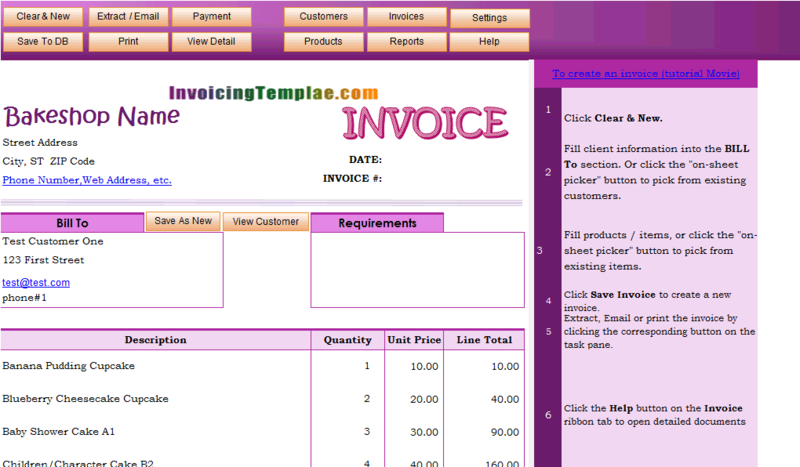 c7005 now includes the customized invoice template for the latest version of Invoice Manager for Excel. 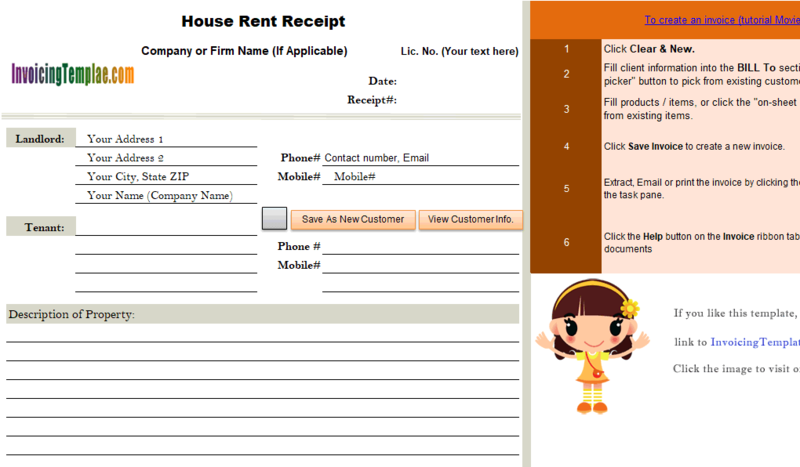 This is what you will see when you open hotelreceipt.xlsx. 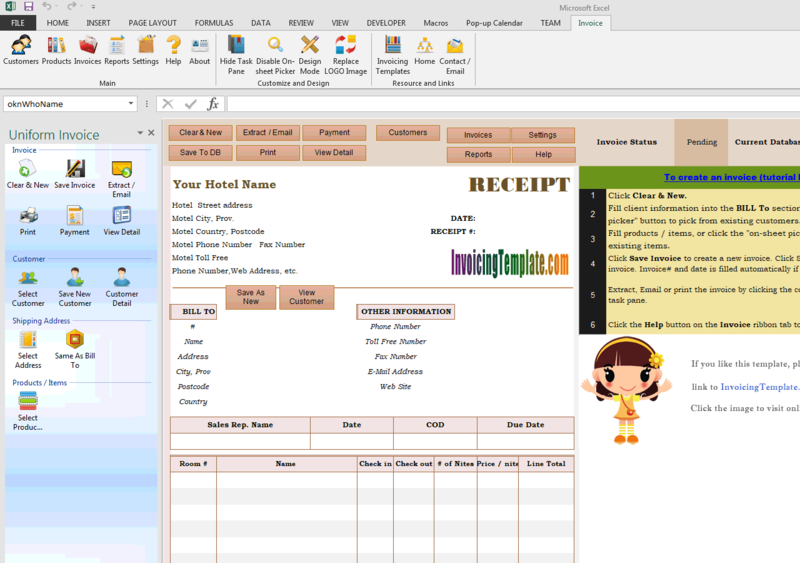 If you use the Invoice Manager for Excel (namely Uniform Invoice Software) version of the hotel invoice template / hotel receipt template, the receipt# (or invoice#) is generated automatically when you save the document. 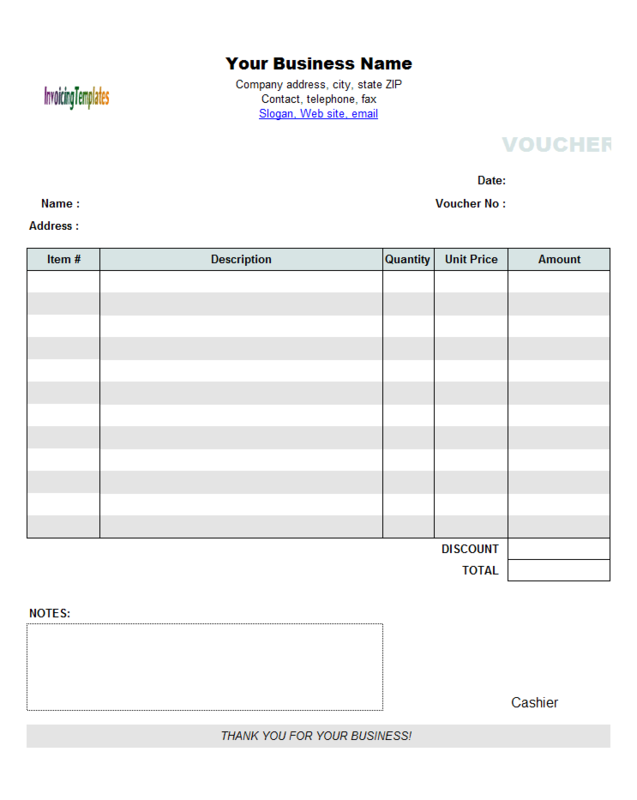 A hotel receipt is also called guest invoice, folios or bill format for hotels. Usually when a folio is opened the starting balance is zero. 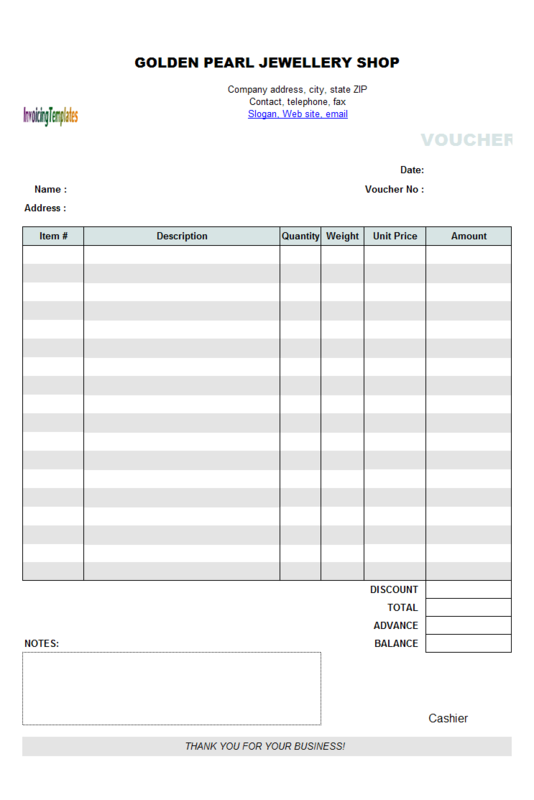 All transactions which increase (debit) or decrease (credit) the balance of the account are recorded on the folio. 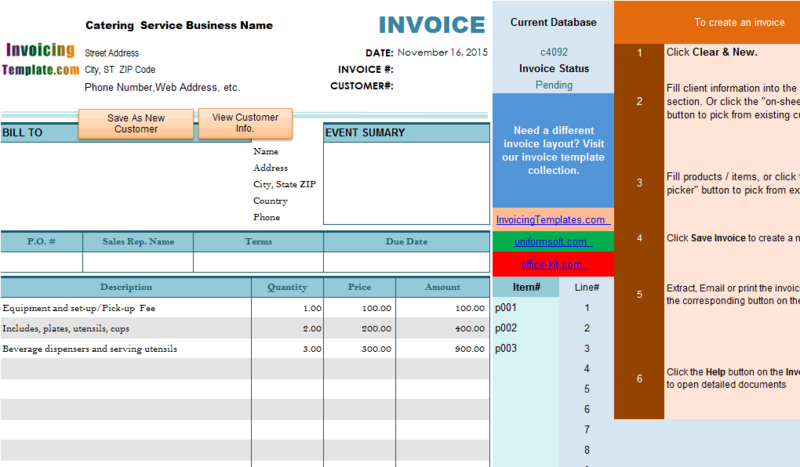 In Invoice Manager for Excel (namely Uniform Invoice Software), when guest does the final settlement of the invoice should be returned to zero balance by any of the method of payment given by guest. 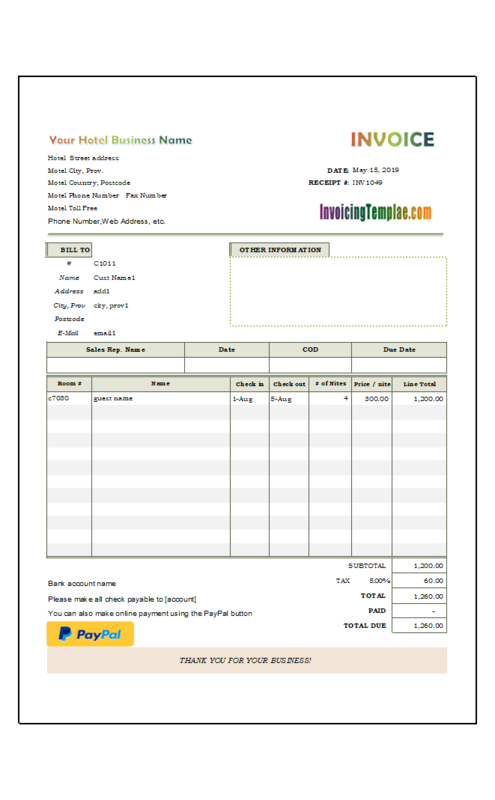 The process of recording transactions on an Invoice or a receipt is called posting. 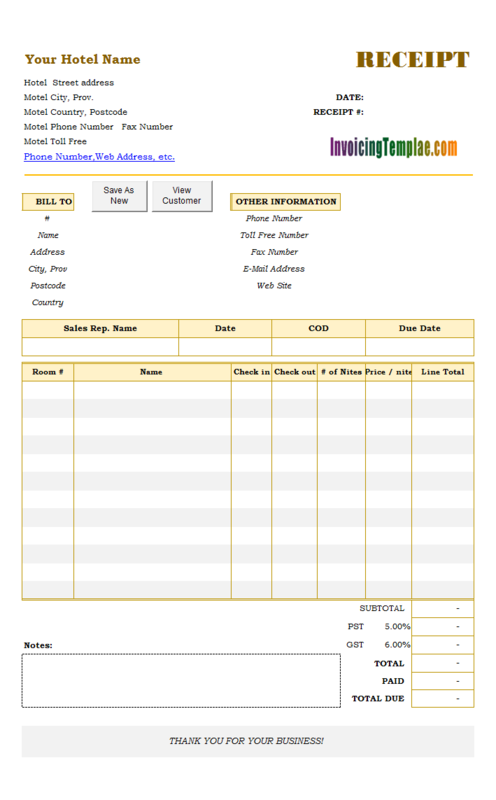 A transaction is posted either debit or credit when it has been recorded on the proper folio in the proper location and a new balance is determined. 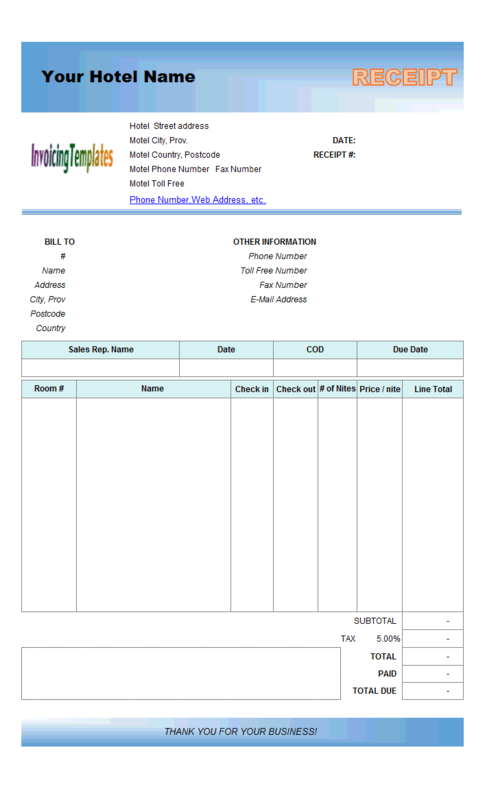 This templates use several custom fields that are not found in the default sales invoice template shipped with Invoice Manager for Excel (namely Uniform Invoice Software). 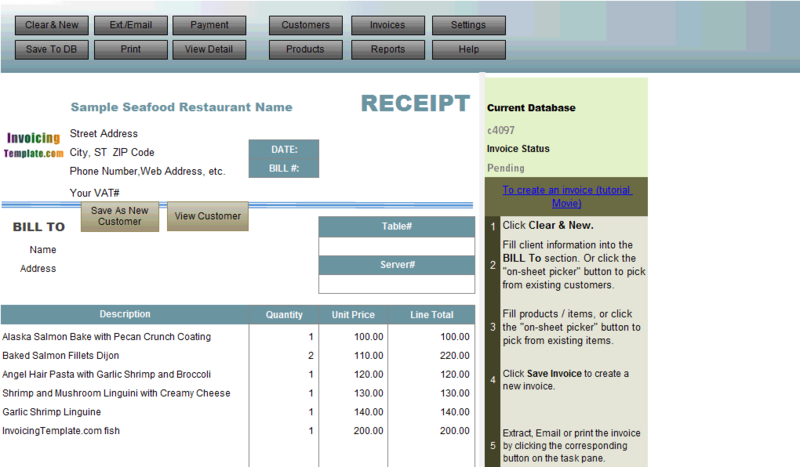 The definition of the custom fields could be found by a travel to the corresponding data edit form in Invoice Manager for Excel (namely Uniform Invoice Software). 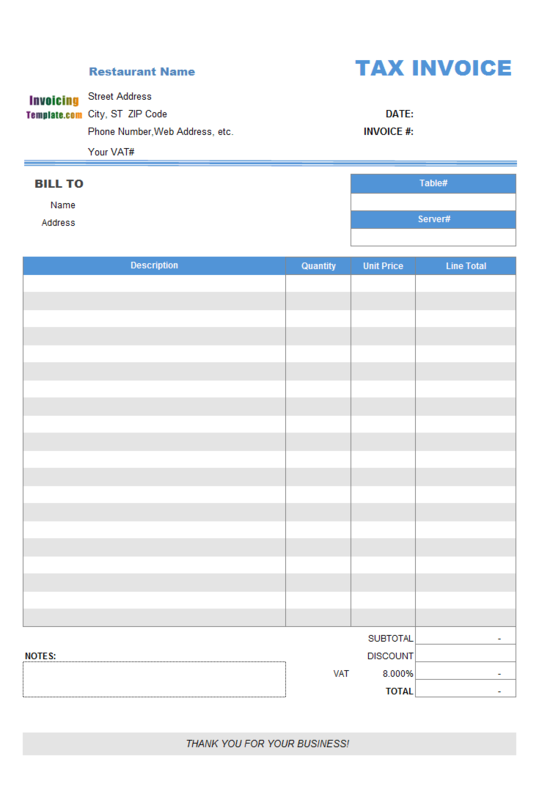 While there are complex and expensive hotel management software programs available, which, generally, could also produce invoices and receipts for you, this free hotel invoice template and receipt template offers a budget-free way for creating professional invoices and receipts. 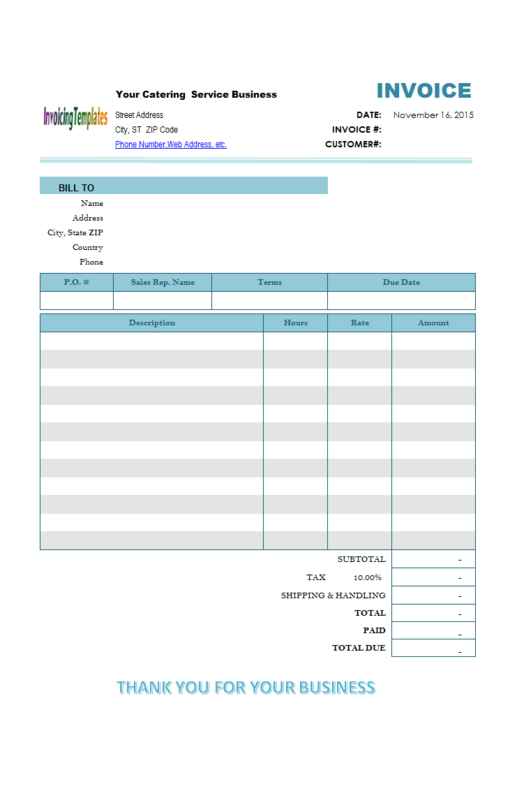 The intuitive blank form of this template allows you to prepare and draft your invoices and receipts without a hard learning curve. 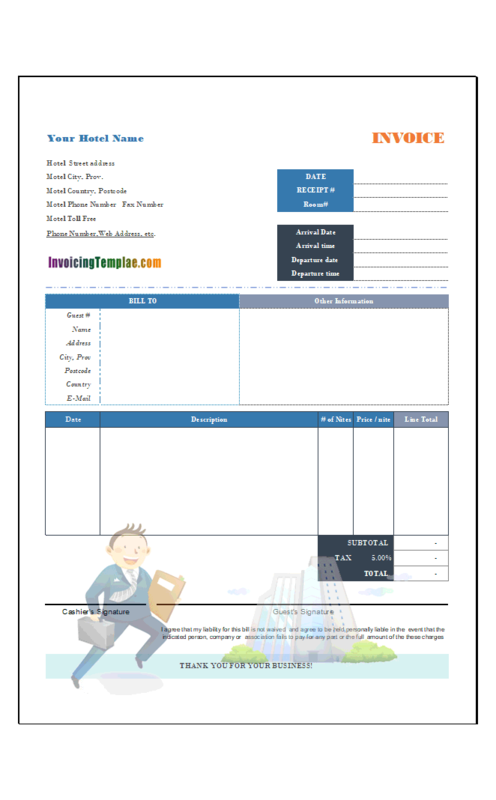 The template has two taxes defined on the bottom of the form - which you can easily change the names and rates depending on your requirements. 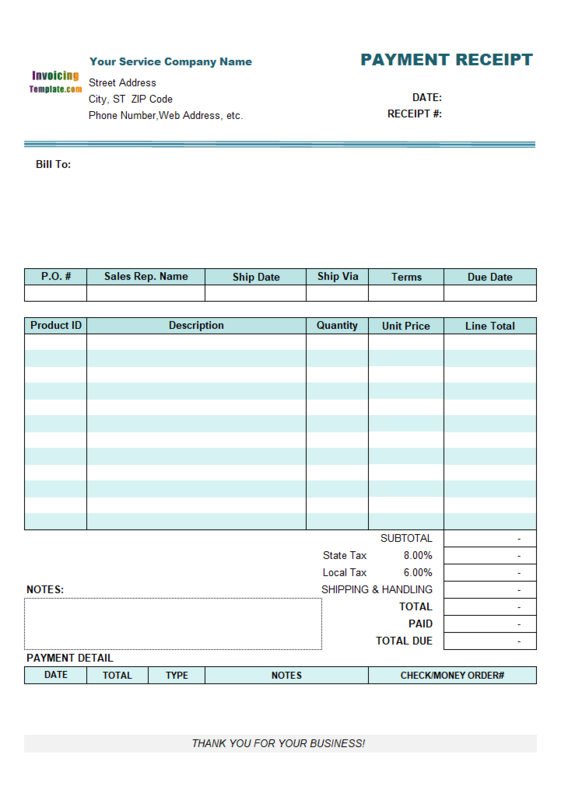 The Taxable column found in the default sales invoice template was removed from the hotel receipt template. 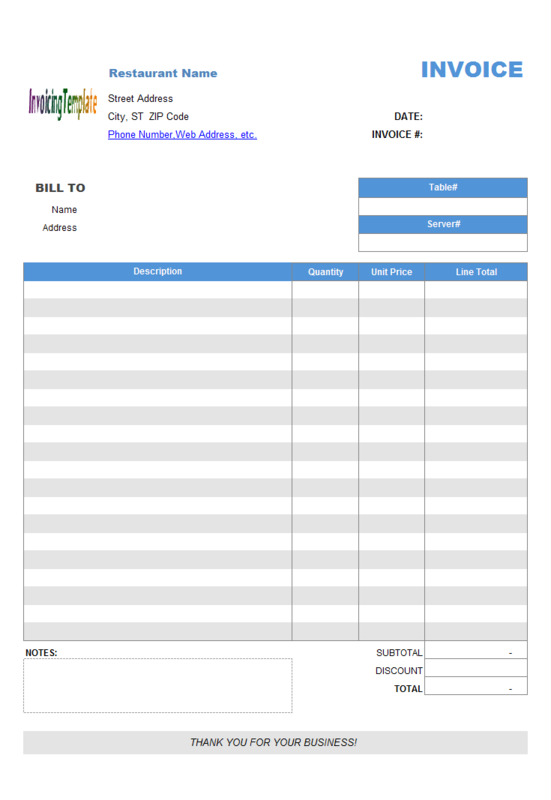 Like other form designs here on InvoicingTemplate.com, Hotel Invoice Template is free (offered to you at a price of 0.00USD). It works on Windows XP and all newer versions of Windows, and Excel 2007, 2010, 2013 or 2016. 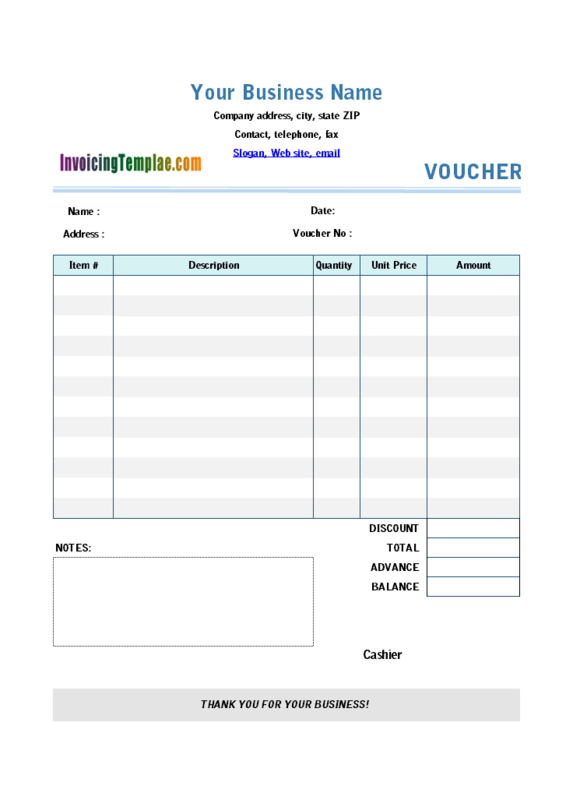 The "Invoice" worksheet is protected by default. Converted from ".xls" to ".xlsx" format.